My Sister-in-law recently bought a really cute new home. (Funny story: The listing for her house was almost the reason we didn't buy OUR house. It was hard seeing a house so close in price tag to ours but the condition and finishings of the house were LIGHT YEARS better.) 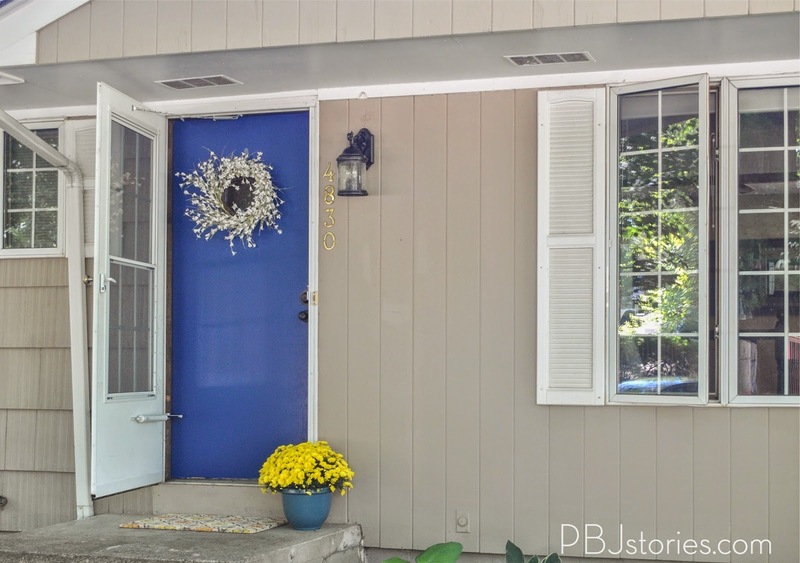 Their last home had a cute yellow door so I asked if they were interested in painting their front door a fun accent color again. Here's her original front door/house. The time of day was some strong direct sunlight so the before images aren't the "best"...but when are they supposed to be. 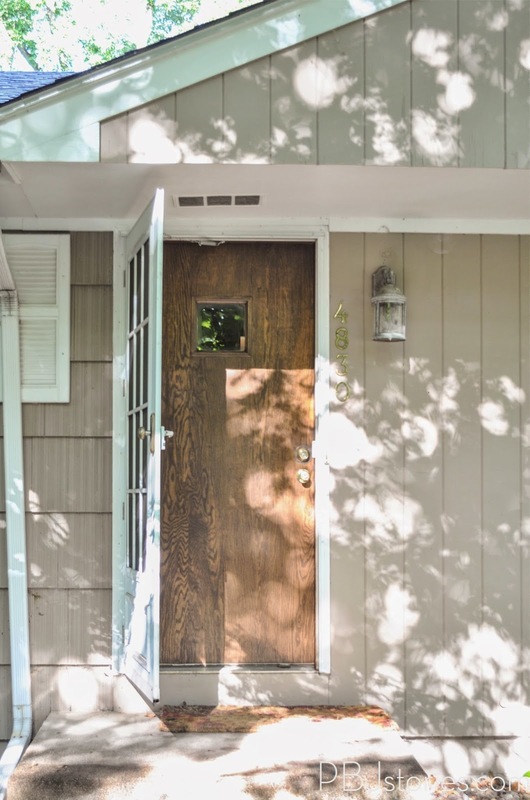 But you get the drift, it was a pretty standard wood door, one panel window with white trim against a beige neutral home. You see what's missing? A little pizazz... a little oomph.... perhaps a wow accent. You get where I'm going with this. Do you remember the last time I really did something with a little pizazz? It's not too often, but when I do I'm QUITE pleased with the result. 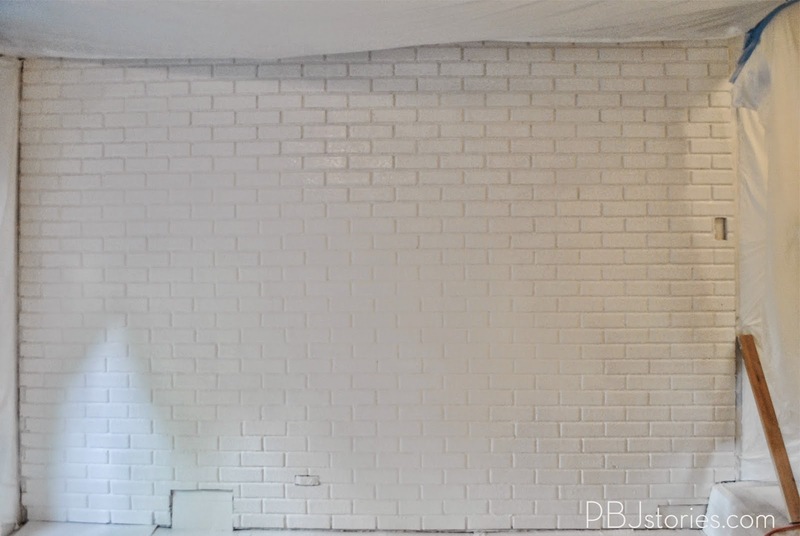 Last time was Baby Girl's nursery ceiling when I used Modern Master's metallic paint. So when they came knockin' at my door to try out their new line of paint it seemed like the perfect opportunity. Now this isn't actually MY front door. 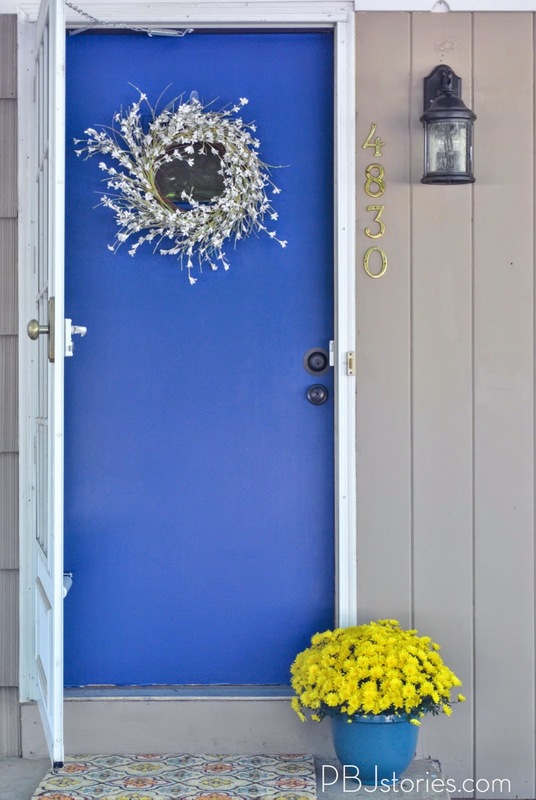 This is my Sister-in-Law's front door and since we've torn our house apart enough for now I asked if she's be interested in a cute little front door makeover for the Fall season, and she was all over it. To be sure I did the prep right we removed it from the door frame and removed the original hardware. 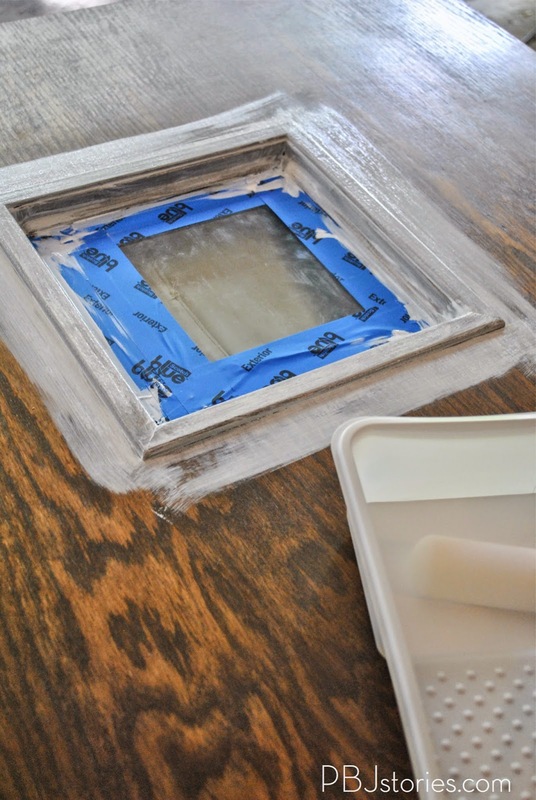 I used a medium grit sanding block and gave it an once-all-over to remove any build up, and the smooth varnish finish of the original door. Next gave it a wipe down and thorough cleaning. 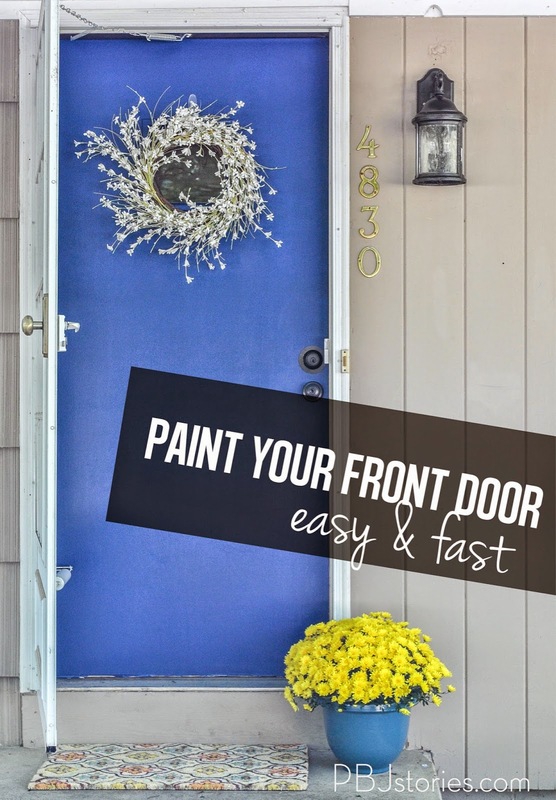 There are a LOT of tutorials the proper way to prep a front exterior door for painting so I was a little nervous what is the BEST way to prep it for their front door paint. 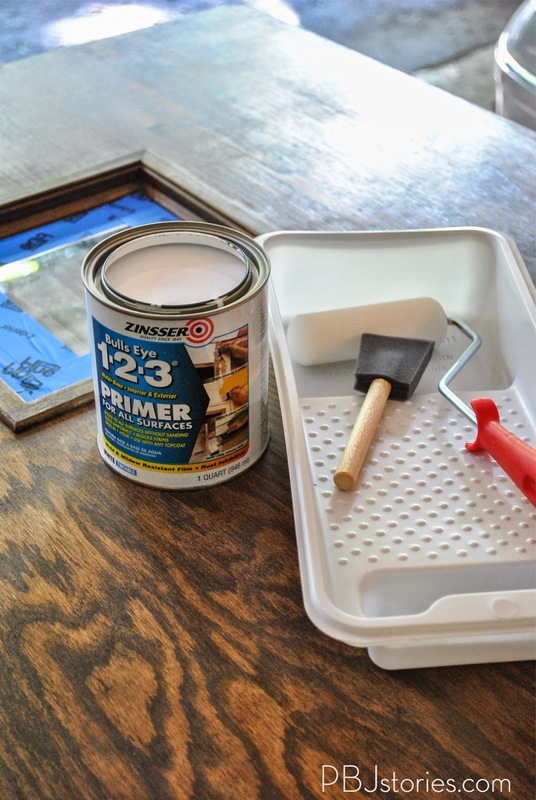 But Modern Masters was awesome enough to just come out and say right on their packaging that Zinsser 1-2-3 Primer was the best to use for their paint. Thank you easy decision. 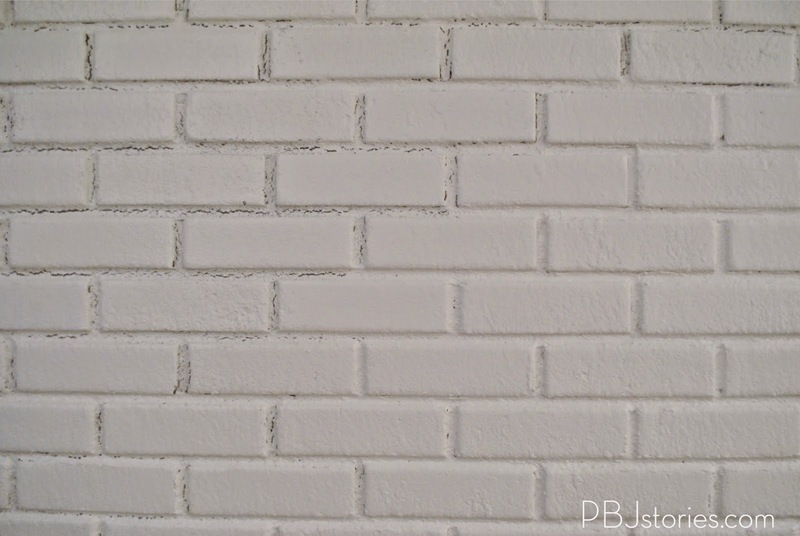 The paint went on easily but I could tell right away that using a white primer and dark top coat that it was going to take a few coats of paint. I just took my time and did long even paint strokes across the flat surface. Two Paint Coats. (Had to reattach the door at this point so they could lock up their house during the night time hours. 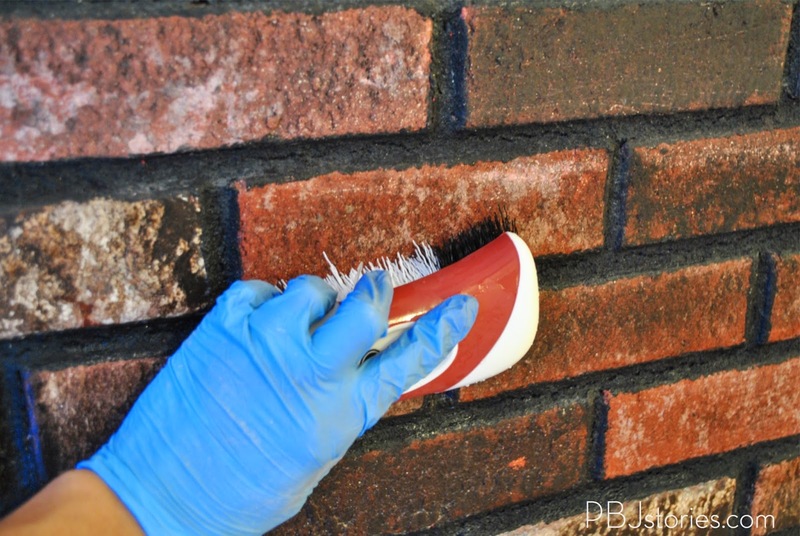 The paint drying time per coat is 3 hours). I love the bold punch of color that the blue gives the space. In the DIY and makeover spirit my sister-in-law took down all her house lights and fixtures and spray painted those with ORB spray paint. They were white so the dark oil rubbed bronze pairs really well with the black, gives it a classy look. 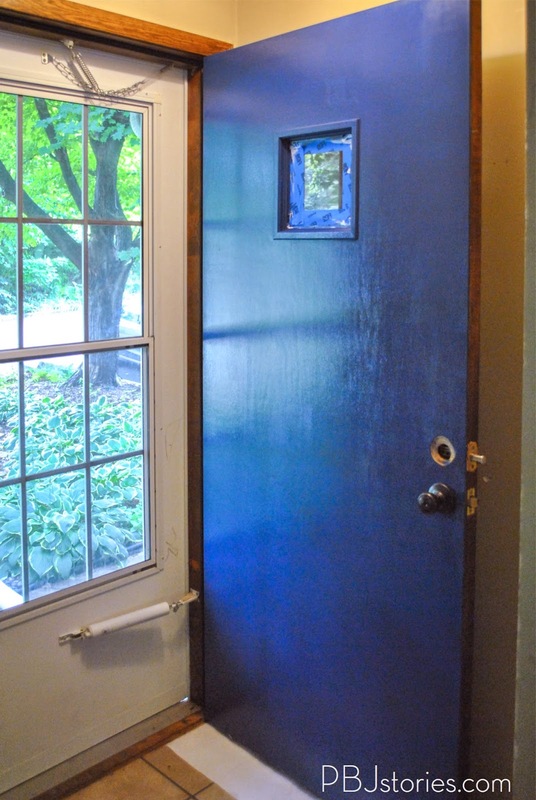 I love that you can subtly still see the color when the storm door is closed. 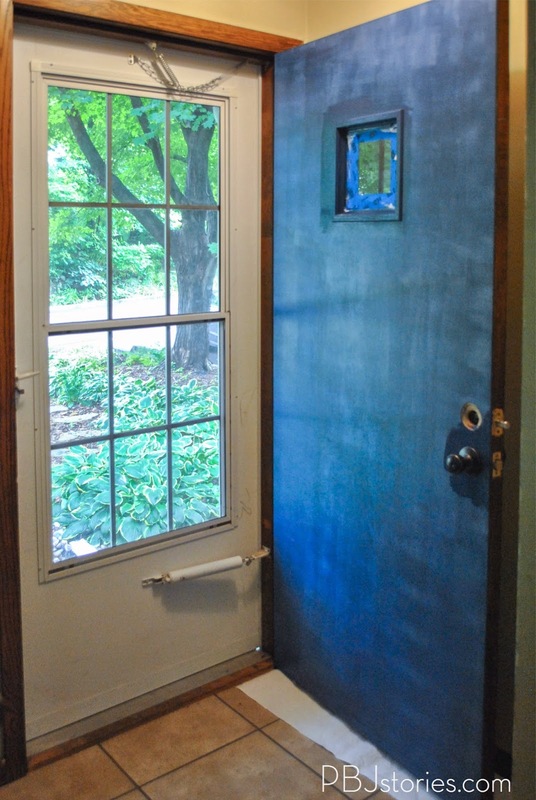 Big downside of living in the Mid-West, storm doors cover your pretty front door. It's crazy the impact a little paint can make. 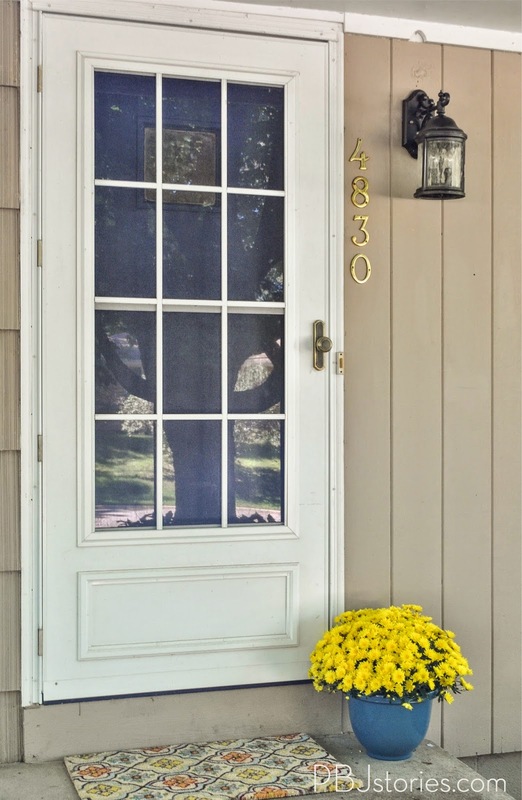 A little low down on Modern Master's Front Door Paint that I used. They have 24 colors to choose from, the color I used is called "Calm" and is a Satin Finish. 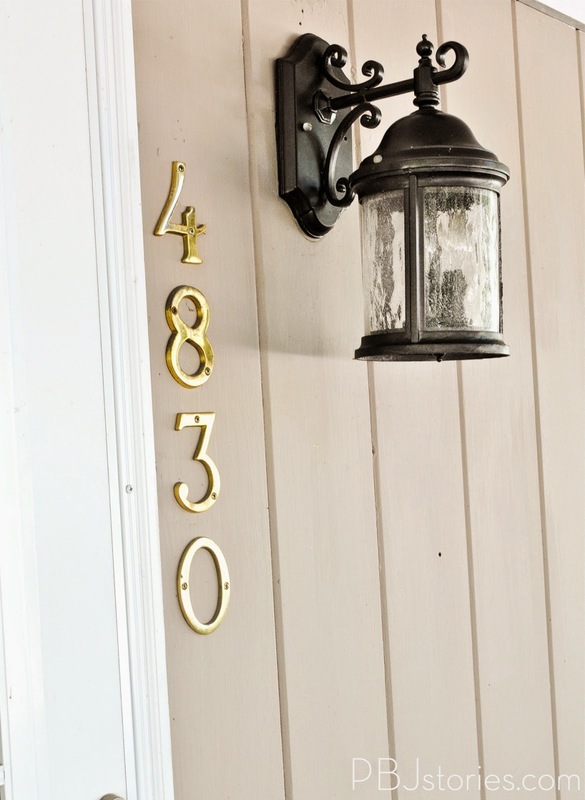 Gloss finish on exterior doors is usually nice because it's a little more durable and resists fading, however their line of Front Door Paint never fades so I love that it's a Satin Finish. 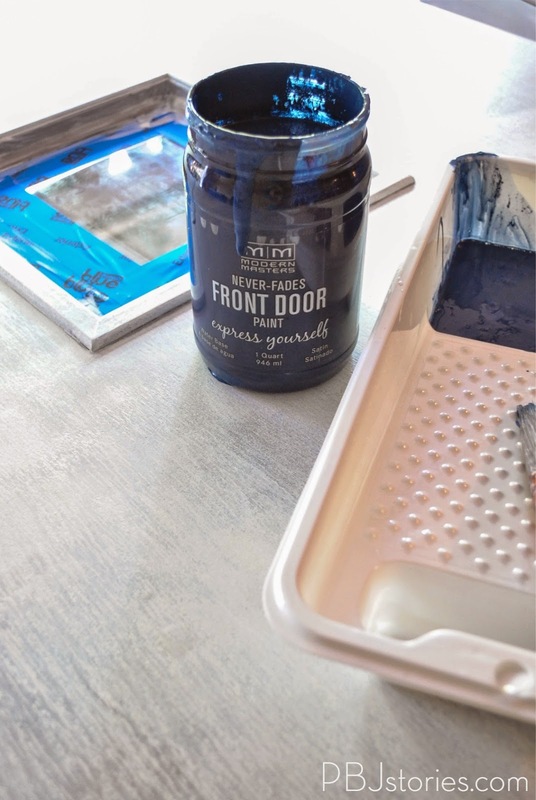 Front Door Paint is available on Amazon (affiliate link) Modern Master's Online Shop and select Lowe's locations. 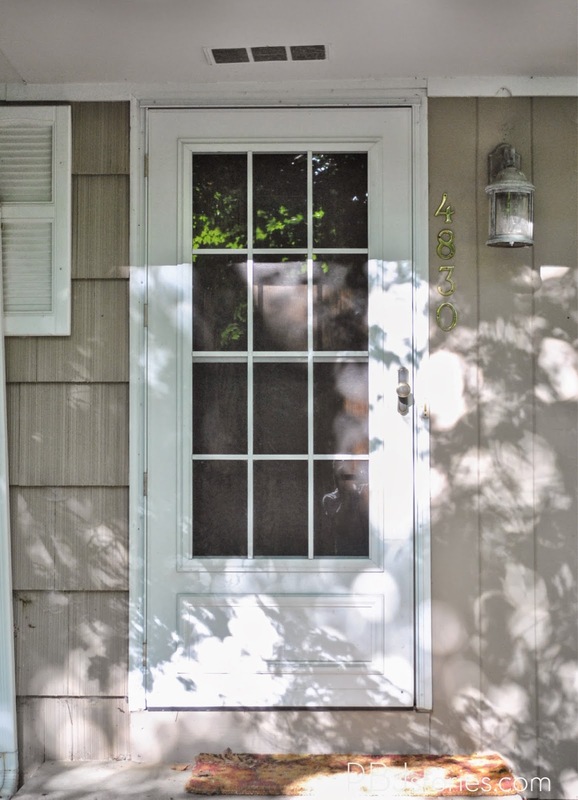 Modern Master's provided me with the Front Door Paint to review, all thoughts and opinions are my own. Almost every night and weekend we spend at our home renovating the kitchen. You know, you know. It's all I talk about. 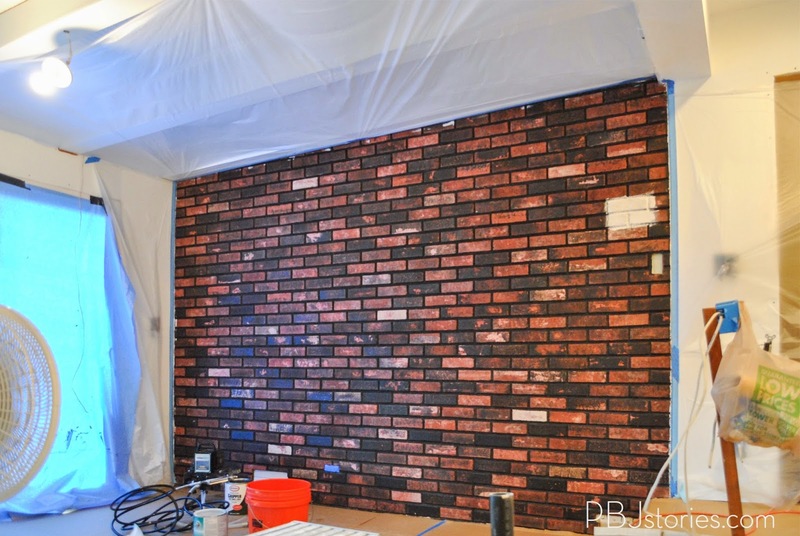 Well, I'm excited to see I finally took the time to do a fun - NOT #PBJreno project that I'll be able to use as decoration once our space is finally done. How cute are these planters? 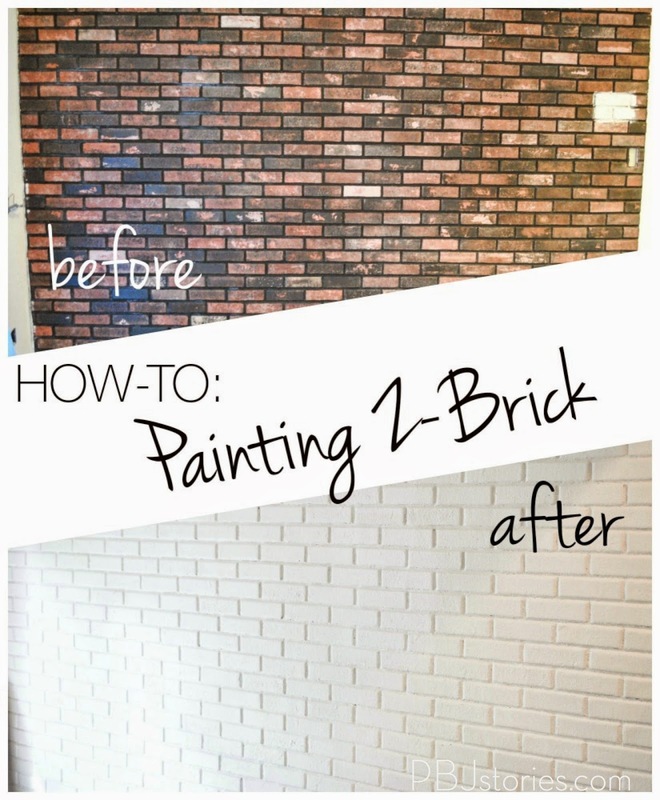 They're super easy too: Step by Step below. Step 1: I picked up my glass containers from my local GoodWill for about $1 each. 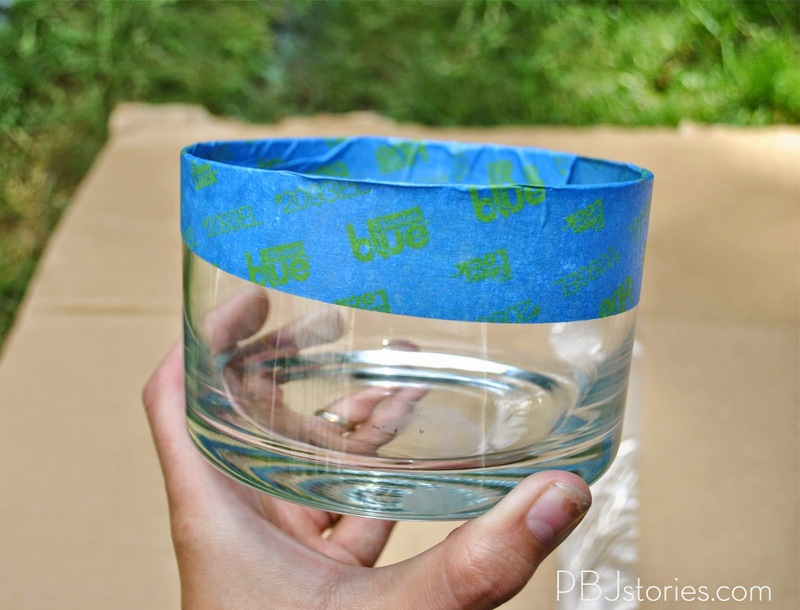 You can use any small containers you have on hand even. I gave them a quick wash before being ready to tape them. Step 2: Using ScotchBlue™ Painter's Tape for Multi-Surface with Advanced Edge-Lock™ Paint Line Protector I taped off the tops of the containers that I wanted to protect from the paint. I did different amounts of tape coverage and application styles on each container to give the collection some variety. 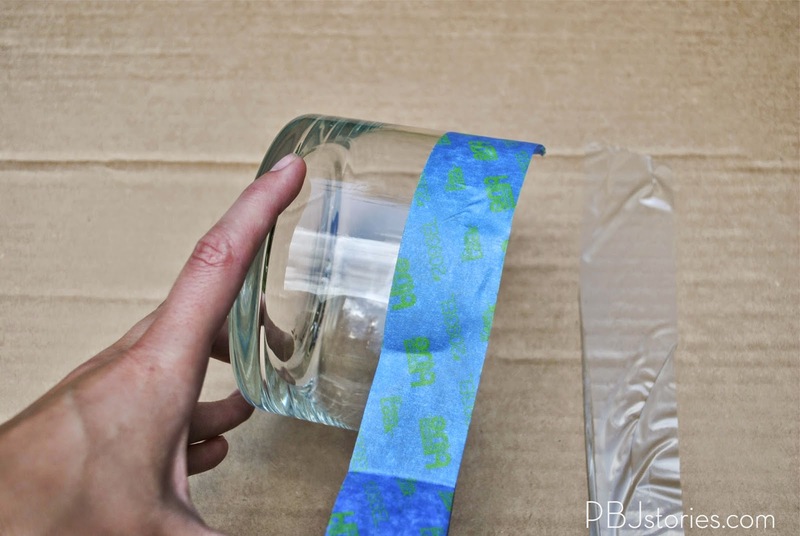 For the “dipped” effect, simply tape the top section of the glass, leaving the bottom section paintable. 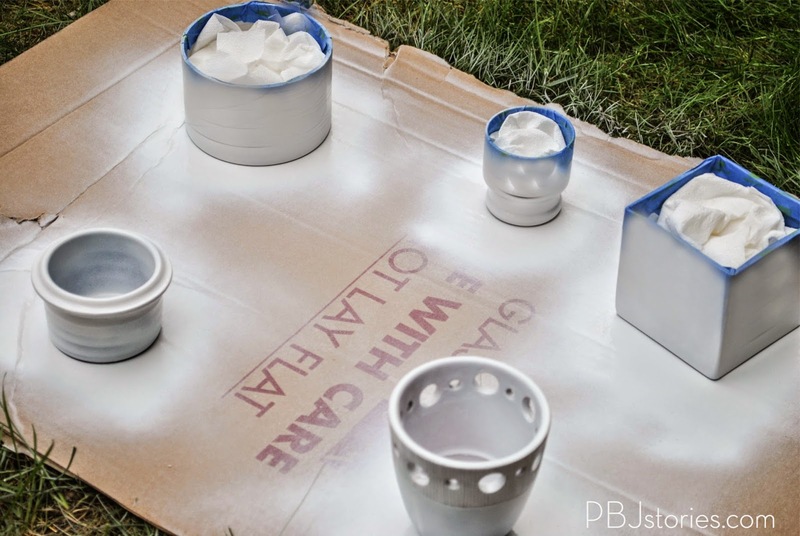 Step 3: In a well ventilated area, or outside, simply spray paint the containers. It’s best to do light even sprays across the glass so you don’t get any drips. 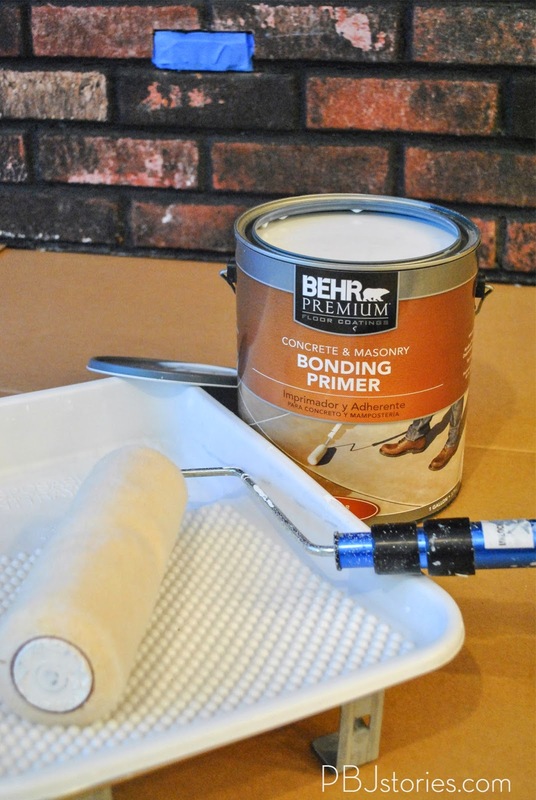 Allow proper drying time in between the coats (check the can as it can vary on the brand). 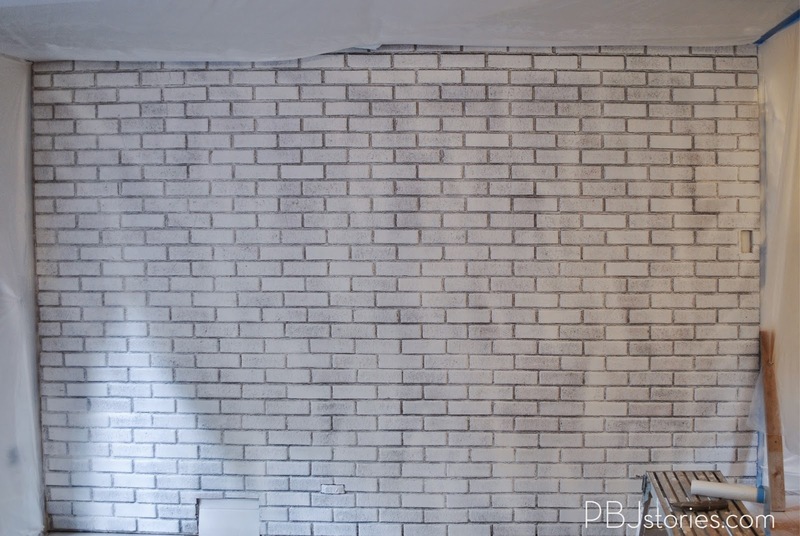 Even though the spray paint I choose was able to be used on almost any surface including glass, I took the time for a little extra preparation and did primer too. After an hour of drying time I then did my color of choice spray paint. 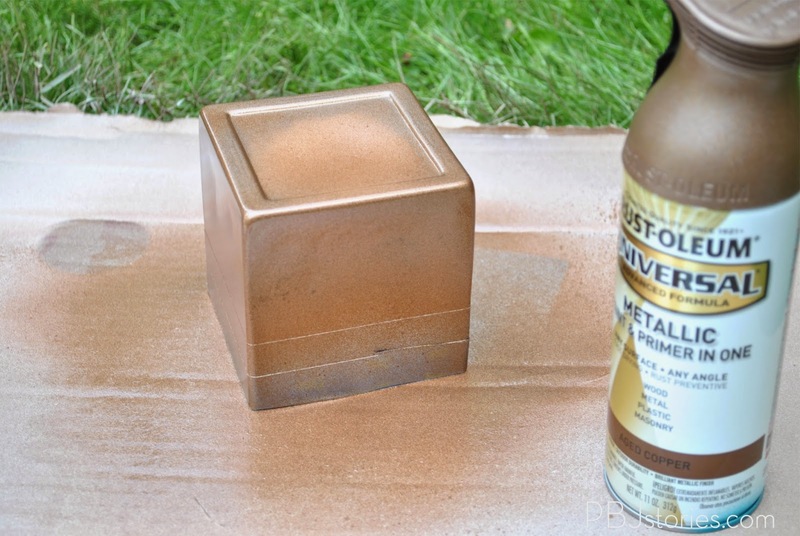 I did a variety of copper, gold, black and white colors for the containers. 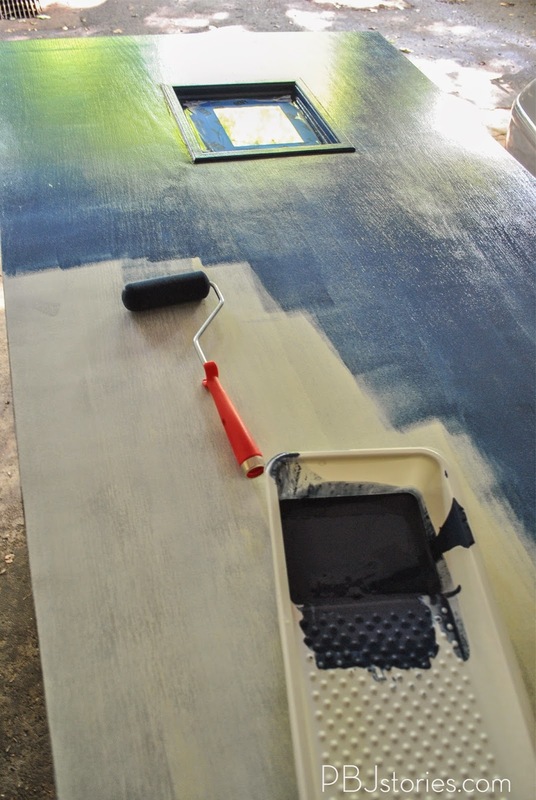 Step 4: Once the paint has dried remove the tape. 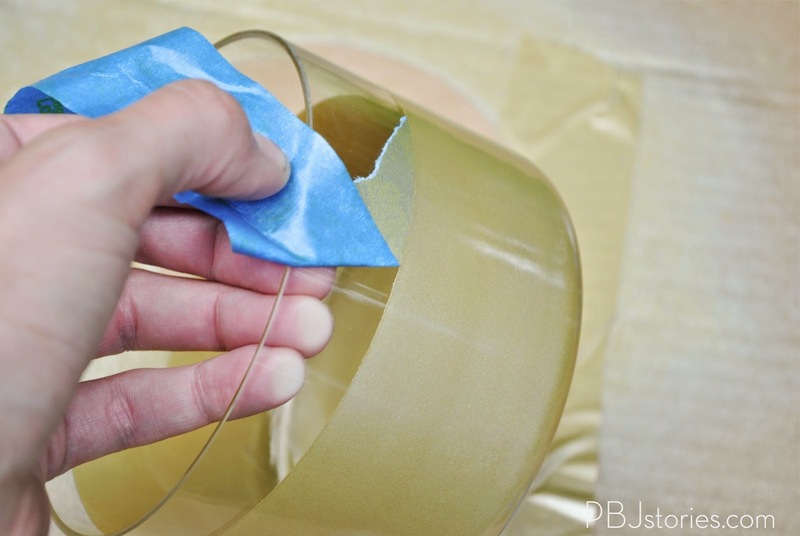 You can use an x-acto knife to gently score the tape line if necessary. 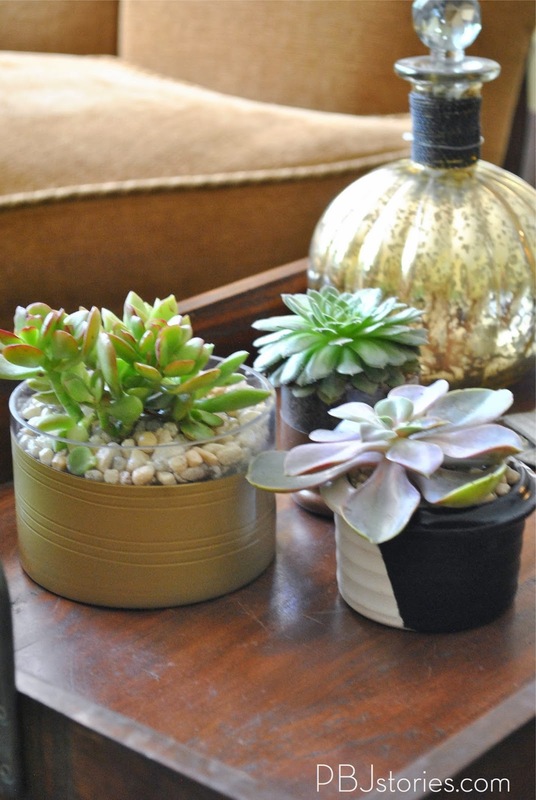 Step 5: Now it’s time to get messy and fill up your containers with your cute plants! 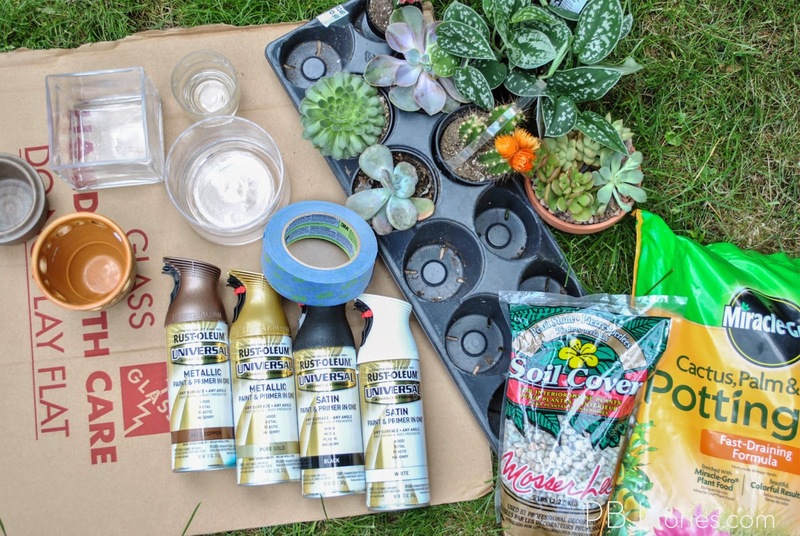 I selected a potting soil that was made specifically for succulents and cactus type plants. I also picked up a bag of River Rock for the toping of some of the containers. 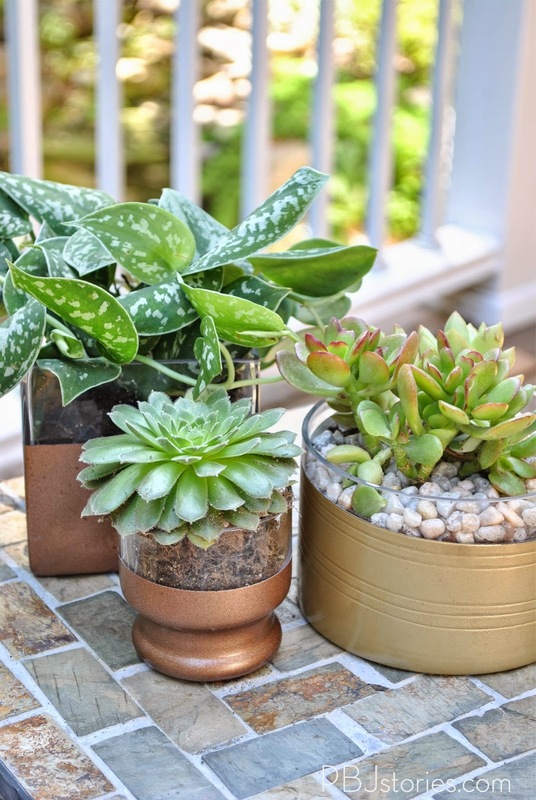 Simply put a small amount of potting soil in each container, insert your succulent/plant and then top with river rocks. 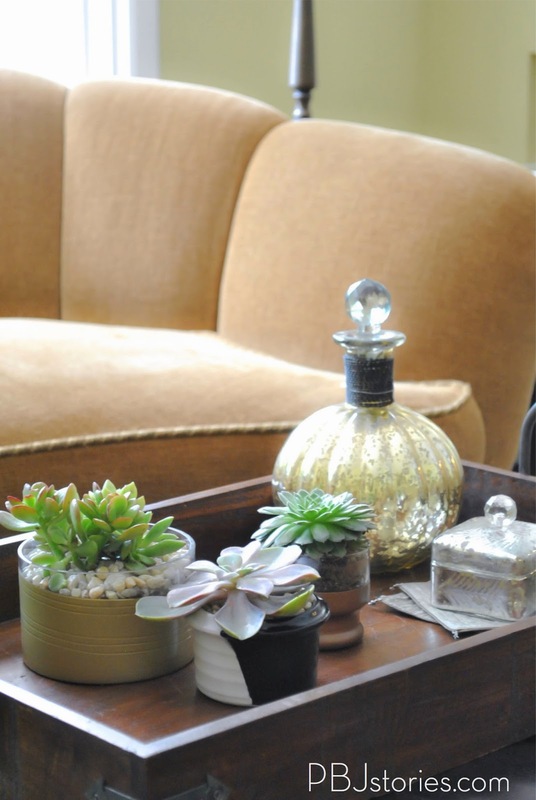 Step 6: Display and enjoy your new collection of adorable and one of a kind planters! We all love Pinterest and blogs right? Why? Because they give you inspiration to be aspirational. 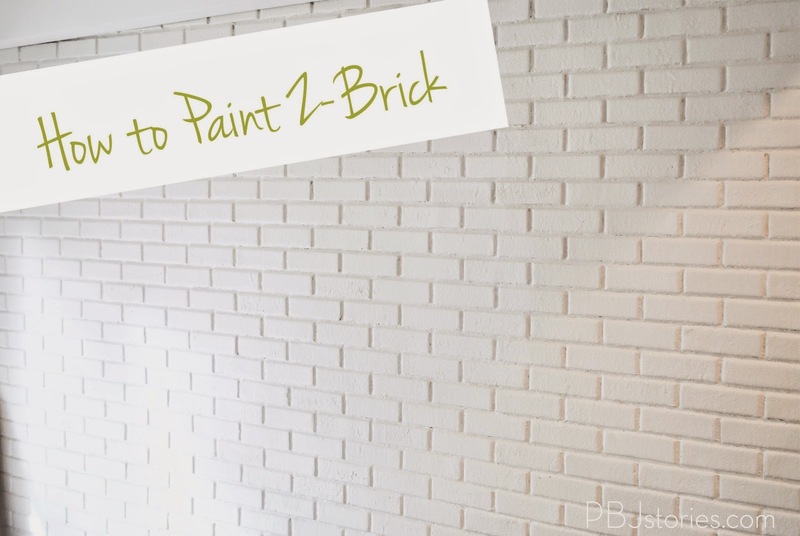 They push you to achieve the DIY projects you SEE everywhere and help you fill in the blanks of the how-to's. It's why I blog, so once I complete a project I can share it with all of YOU so you can all do it. 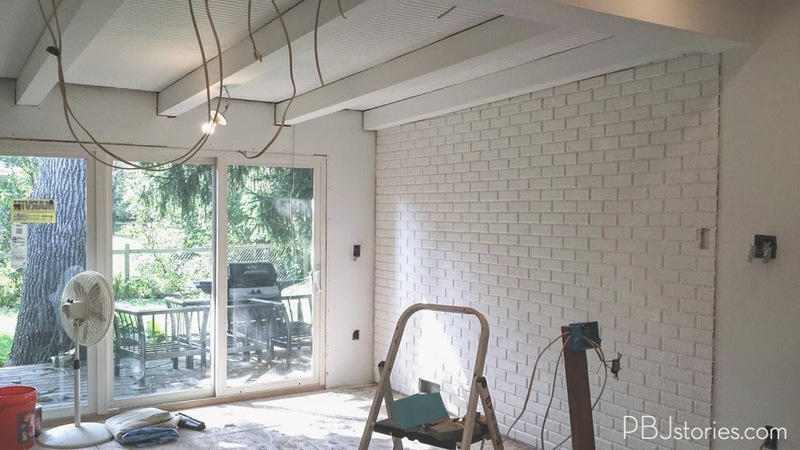 Well ScotchBlue™Painter’s Tape has a contest going on right now for a chance to win big, but not just to win big but to submit your project and become one of those part of a gallery of DIY projects that are inspirational. Check out more details of the contest on their website, ScotchBlue™ Facebook page . In addition check the Mecca of all DIY inspiration, their ScotchBlue™ Pinterest page . October 1, 2014 through November 15, 2014 and you could win $5,000 to put towards a home makeover! 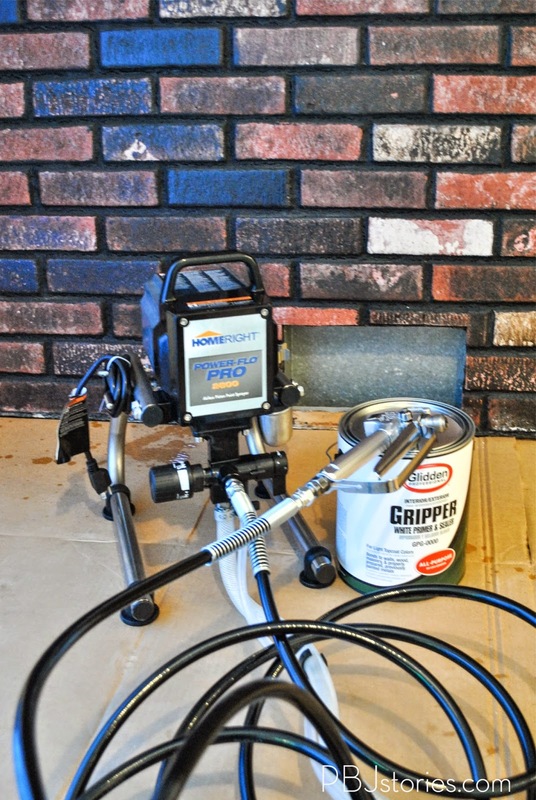 The first 500 to submit an eligible entry will receive one (1) roll of the new ScotchBlue™Painter’s Tape with Advanced Edge-Lock™Paint Line Protector! from October 15, 2014 at 12:00:01 a.m. CT through 11:59:59 p.m. CT on November 15, 2014. Construction and Home Improvement Markets Division, St. Paul, MN. If you remember I talked about my kitchen inspiration earlier and I have wanted white upper cabinets from the second I walked into this space. I knew I wanted a shaker style too... they has clean simple lines and was exactly the style I wanted. I did a LOT, and I mean A LOT, of research for companies that I wanted to choose for our cabinets. I started looking at custom cabinetry companies and once I received a few quotes knew that was an impossible route, they offer a lot of customizing and high-quality materials but have a high price tag which we did not have a budget for. 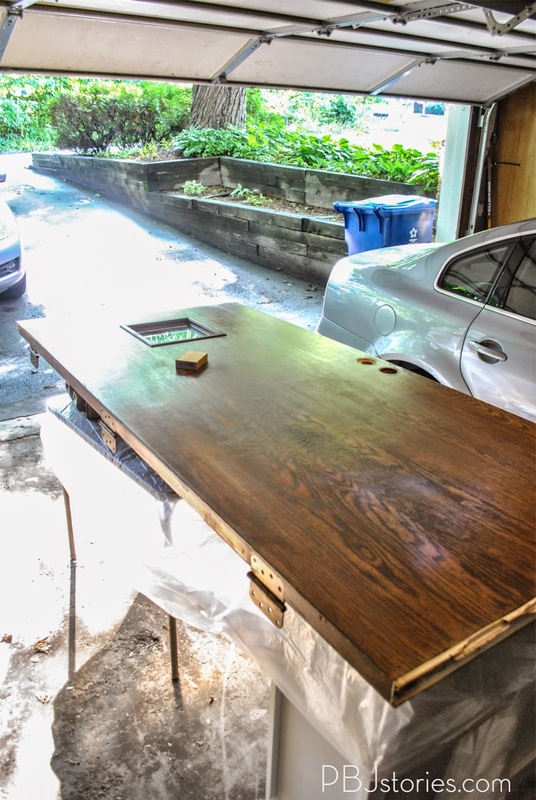 I did a few price quotes at Home Depot and Lowe's for a variety of their brands and it was more reasonable, but still slightly higher than I was comfortable with. I was almost certain we were going to go with Ikea cabinets, but because I wanted a two-tone kitchen and wanted dark grey base cabinets and again was hitting a dead end as they didn't have their Shaker-style cabinets in that color. After more research I found RTA Store and they offered both pre-assembled and ready-to-assemble cabinets which is a great cost savings option. But most importantly (to me at this point) they had a dark grey Shaker style cabinet - WAHOOO! Working with them was really great, I was teamed up with a designer that helped me do a virtual layout of my kitchen so I knew exactly what I needed. I thought I educated myself enough throughout the research process what exactly I would need, but there were a few items here and there that the designer was really able to help me with and point out more beneficial options. 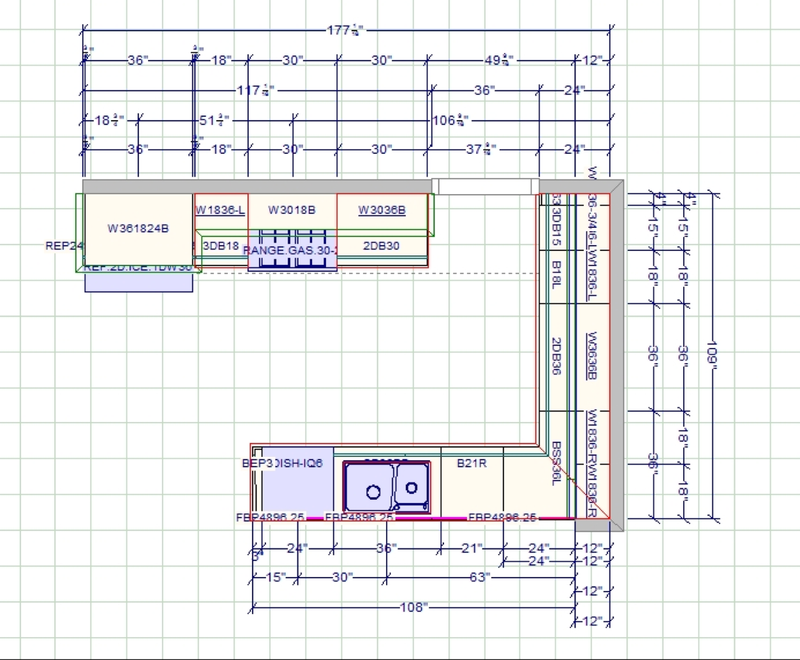 So after we worked through the details of my kitchen they sent me a blueprint layout which was really nice being able to bring that back to my kitchen space and really be sure all the exact measurements would work in the space. 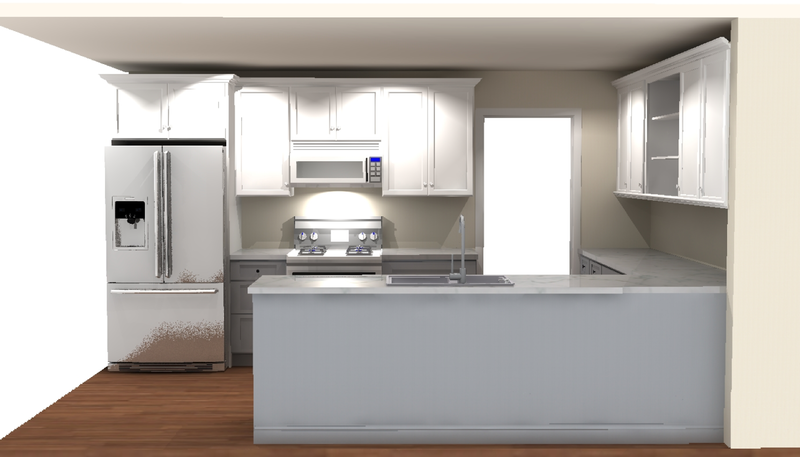 The other really cool part during the design phase is they sent me a 3D rendering of my kitchen -- this felt like GOLD at that point. 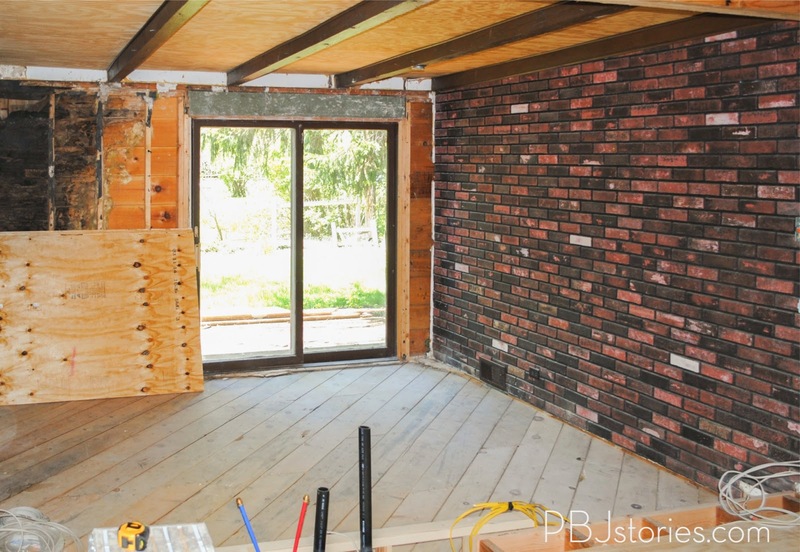 I was staring at studs and joists at this point and it was the first time I truly saw what I "envisioned" in my new kitchen. 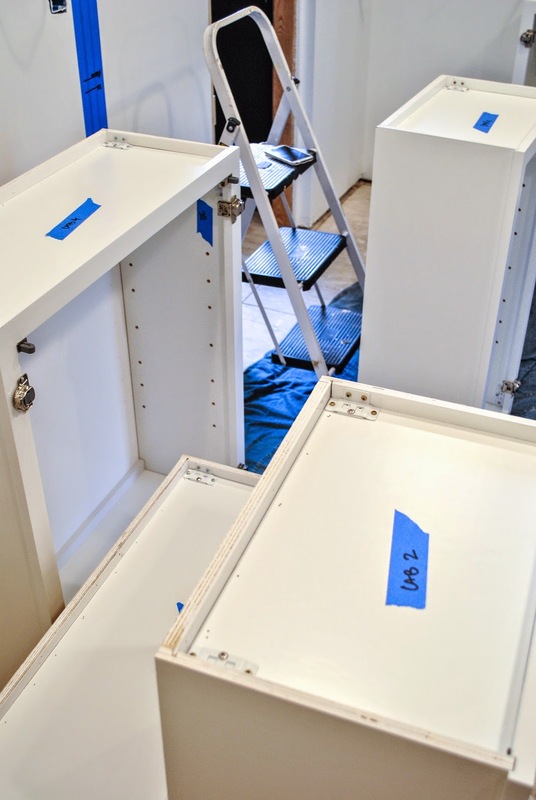 The upper cabinets we ordered are the Aspen White Shaker Style cabinets and are ready-to-assemble cabinets so they are less expensive than the pre-assembled cabinets. When we received the upper cabinets they had to sit in our garage for a few weeks while we were building the bones of our kitchen back --- adding sub-floor, sheet rocking, taping/sanding etc... so one we finally had the backbone of our kitchen back it was time to start installing the upper cabinets! 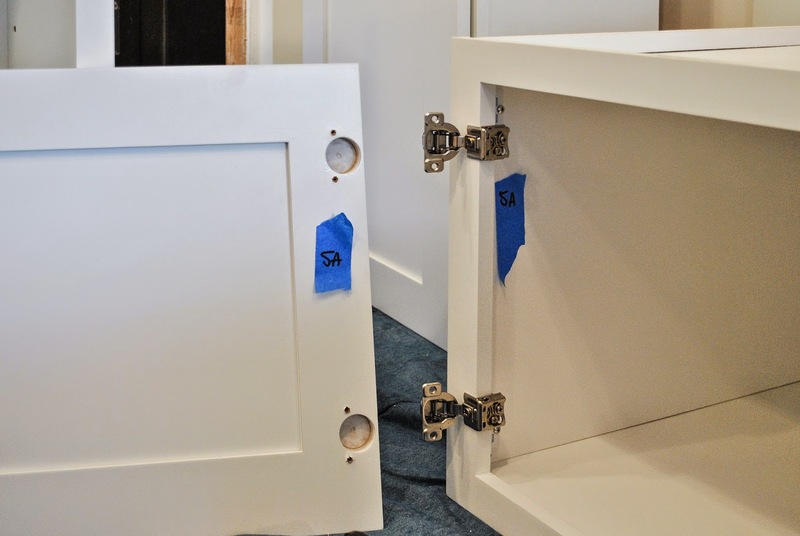 Once I assembled the cabinets I went back through and labeled all the doors so I was easily able to know which doors reattached to which cabinets. Then to make the installation process I labeled each cabinet in order of how I would be installing them on the wall. 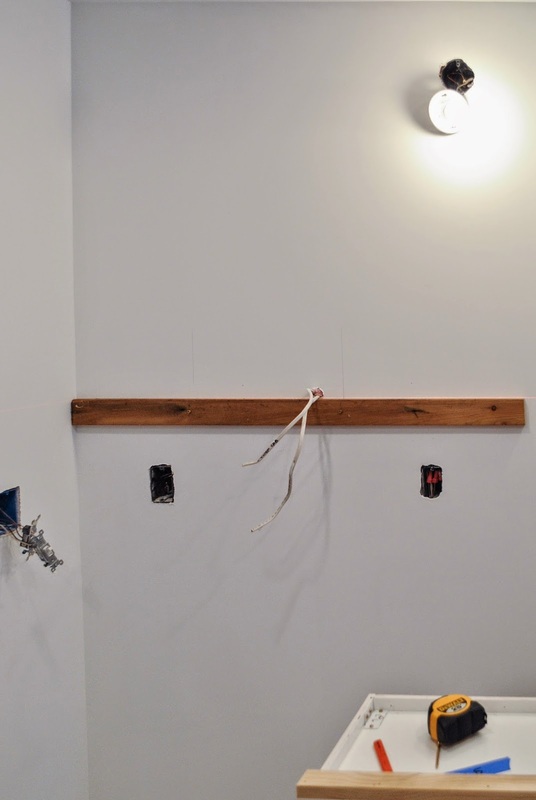 Jumping right into the installation...on one wall I was doing cabinets on each end of the wall with floating shelves in the middle. On the left side, instead of doing a full 36" cabinet I wanted the two cabinets to be separated so it was easier to store different items in the cabinets - but I wanted it to still look like a full cabinet so I decided to have the right 18" cabinet open with a left swing just as a full 36" cabinet would be. 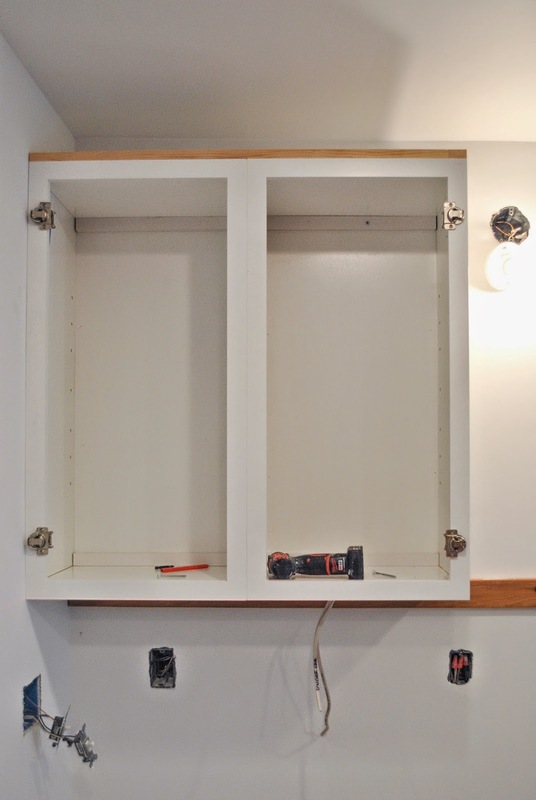 We wanted the cabinets to be seamless so we attached the two together before attaching to the wall too. Then before attaching to the wall, we needed to add a backer piece to support the attachment of the crown molding. I figured out how to do this just by searching online and finding that adding a piece of backer to the cabinet and then stapling the crown molding to that is the easiest/best way to add it. We just used a 1x2 and measured the full length and sides of the cabinet depending on where we were adding the molding. We drew that line with a laser level across the entire span of the wall and used that as a guide for our ledger. 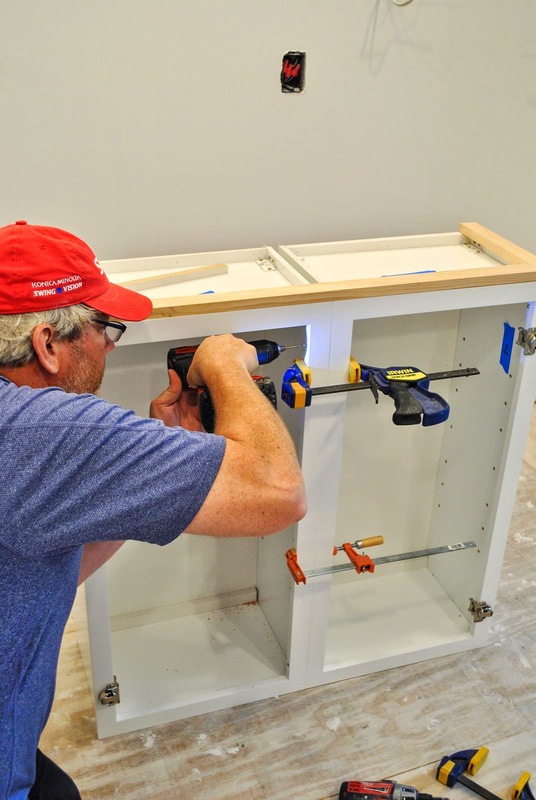 The ledger acts as a support piece to set your cabinet on while installing the cabinet. 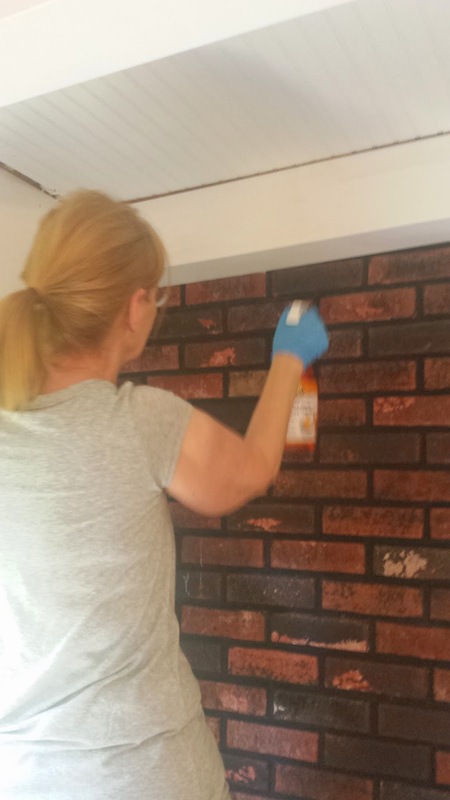 So instead of me trying to keep the cabinet level and supported while my Father in Law screwed the cabinet to the wall, we were able to lift it up to the ledger and I simple had to hold it against the wall - MUCH easier. 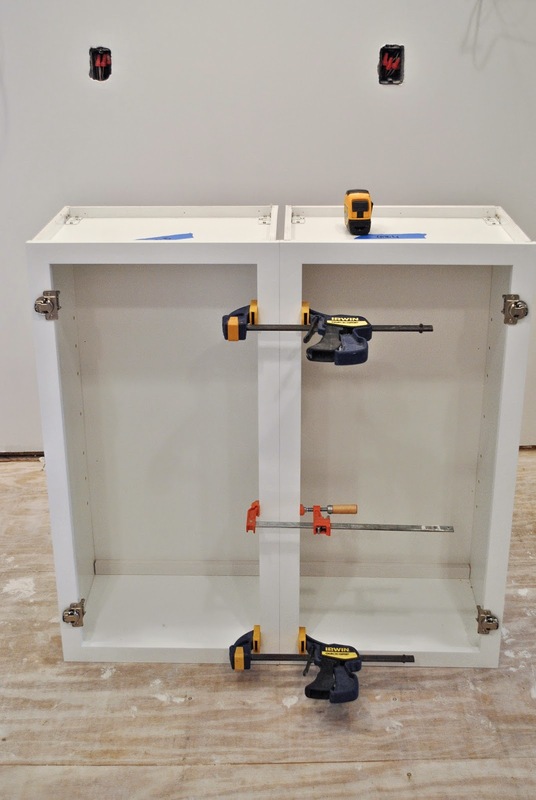 Then we just screwed through the cabinet into the studs. This is the part that gets a little tedious. 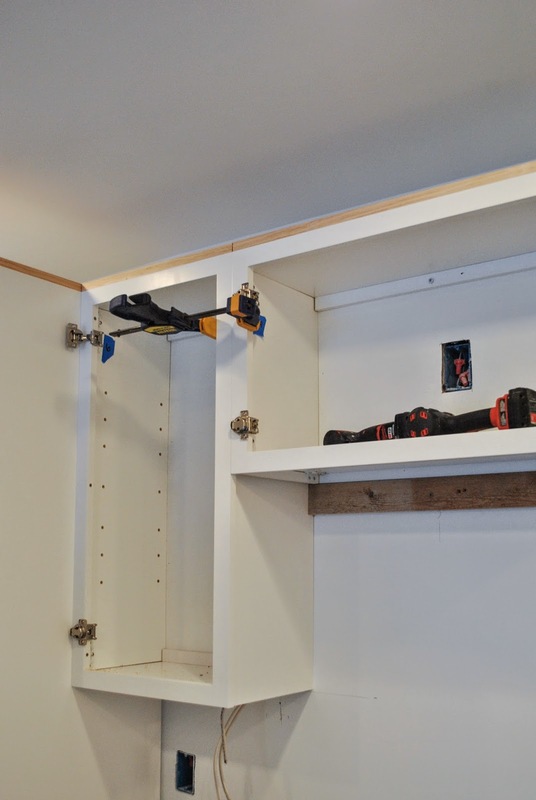 There is a LOT of small maneuvering once your cabinet is up to be sure it's level both horizontally and vertically. 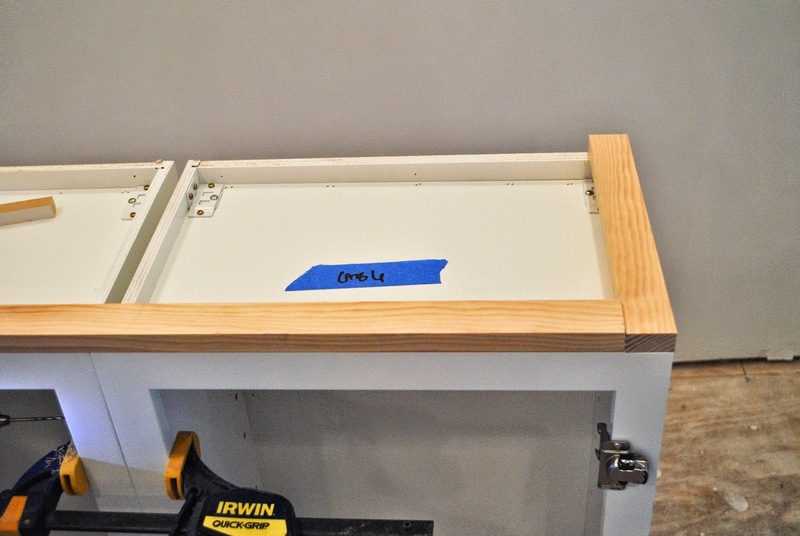 If you need to make small tweaks use shims to get the cabinet as flush, and level, as possible. Then when you move onto the next cabinet - you'll have to do the same plus be sure it's square with the cabinet directly next to it. 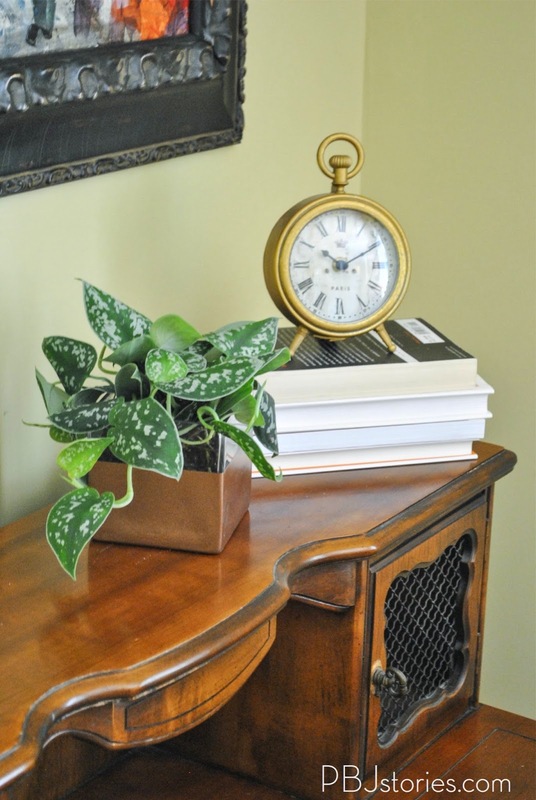 Once it's completely level, attach to the surrounding cabinet too, not just the wall. 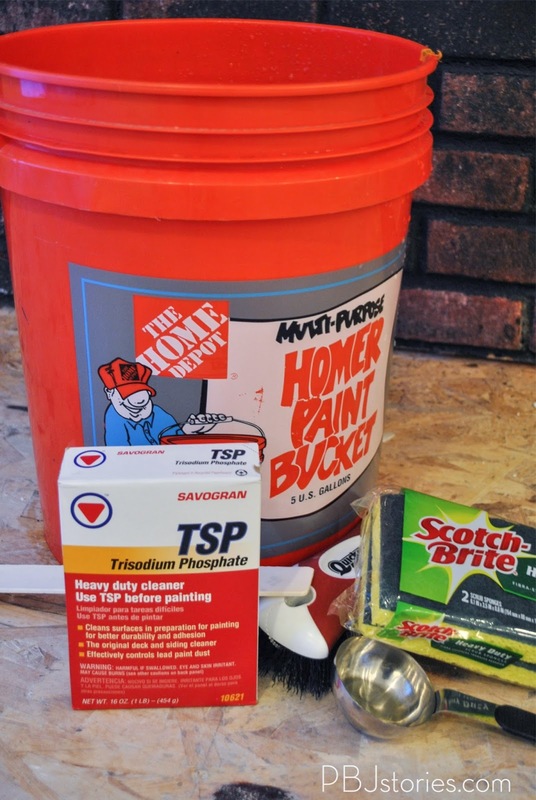 This will help keep the seams of the cabinets flush and look seamless. It's been weeks since we installed these cabinets... and I cannot wait until we can fill them up with our goodies. What do you think of the style?!! Are you a fan of white cabinets? I still have to pick out our handles/knobs for them. It's like picking out the final jewelry piece for your favorite outfit... it was to be just perfect!